Barossa Valley Brewing, Fri 23 Feb. If you’re up for spending the evening downing wonderful wines, beautiful beers and fabulous food, then this is exactly the right experience for you! 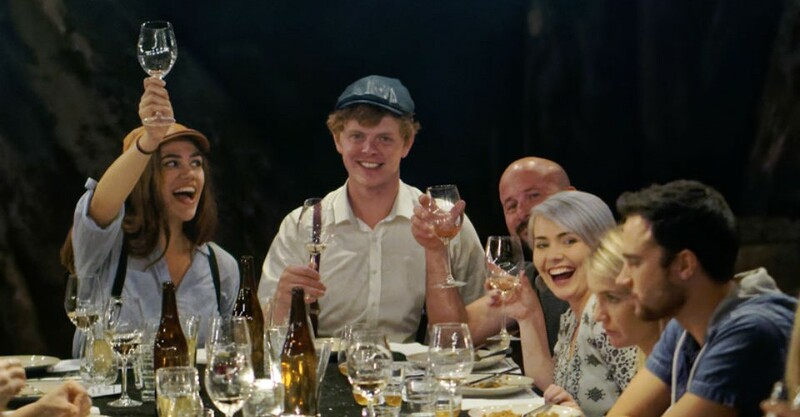 Throw in a quick visit to check out the brewing operations and the chance to learn more than you thought you might from brewer and winemaker, and you have all you need for a terrific night out in Tanunda. On this evening, Barossa Valley Brewing founder Denham D’Silva was joined by winemaker Huon Fechner from nearby Teusner Wines. Matching a carefully selected beverage to accompany each of the five delicious courses served by Chef Liz Upton was the easy part. The difficulty was in convincing the crowd of genuinely excited diners that their beer or wine was indeed the better match. Denham has been doing this for a while now and his passion for his product is well and truly put to good use as he argues the merits of each pairing very convincingly. Not to be outdone, Huon held his own and managed to score a few well deserved points. The fun continued as the boys exchanged good natured jibes to the great delight of all involved, many diners joining in as the courses – and drinking – continued. Standout fare included the fabulously ‘hoppy’ Wallaby Cider (not technically a beer but who cares?) that matched perfectly with a delicious first course of Bagnacauda (an anchovy fondue with seasonal vegetables) and the stunning 2015 Avatar GMS that danced beautifully with its partner of Greek spiced lamb. Along with the food and drinks, the cheeky atmosphere made the evening hard to fault, with diners clearly relishing the whole voting thing, the interaction getting louder and funnier as the night went on. While the final result was a clear draw, by then nobody minded since such a great time had been had by all. It’s no wonder almost all diners were repeat visitors – the experience really is THAT good. BEER V WINE DEGUSTATION DINNER continues at Barossa Valley Brewing from 7pm until Sat 3 Mar. A great mix of wonderful wines, beautiful beers and fabulous food!